The December issue of The American Philatelist included an article by Russ Hahn on postage stamp collage (PDF). In the article, Russ asked for additional contributions to an archive of information about stamp collage art and artists. We have received quite a few responses to that call for contributions, and will share them here and in the AP. This morning, I received a message about some examples of stamp art that will be on display at the Westfield Stamp Show in Westfield, New Jersey on March 2 (tomorrow). 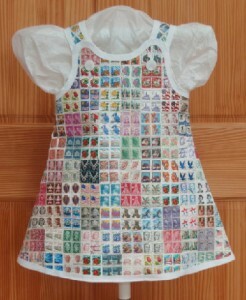 Artist Audrey Yankielun creates wearable art by stitching stamps together. You can see examples on her website, in an article on USPS News Link, and if you happen to be in New Jersey this weekend, at the Westfield Stamp Show.